I’m Josh, the newest employee here at Volumes and for some reason the store owners gave me permission to gush about one of my obsessions. No, not Irish folk ballads (yet). I’m talking independent publishers. That’s right, this is the place to get indie, to find the stuff that “the man” doesn’t want you to read. Indie presses are doing cool things, because they’re working with books they want to be putting out in the world, not necessarily because they’re bound to be best sellers. The indie publishing scene is florishing with folks bringing great art into the world. So I want to thank you for coming on this journey with me as we start off with one of my favorites! Columbus, Ohio is the birthplace of R.L. Stein and Guy Fieri, as well as to one of the coolest indie publishers in the world: Two Dollar Radio! Though technically, Two Dollar Radio started in San Diego, Eric Obenauf and Eliza Wood-Obenauf found a home for their publisher in Columbus, and have been pumping out amazing books since 2005. Two Dollar Radio has not only produced some great literature, but released two feature length films with more to come. And if that isn’t enough, in 2017 Eric and Eliza teamed up with their longtime collaborator Brett Gregory and Two Dollar Radio Headquarters open its doors, making Columbus the home of my favorite bookstore/cafes outside of Chicago. Plus, they also founded The Flyover Fest, a three day, multi-venue music and literature festival held in Columbus. And if all that isn’t keeping them busy, the Two Dollar Radio team leaders are raising families, A.K.A. the next generation of indie-supporting-superstars. Brett Gregory, Eliza Wood-Obenauf, and Eric Obenauf during construction of Two Dollar Radio HQ. You might recognize some of the faces on their book roster, including Hanif Willis-Abdurraqib, author of They Can’t Kill Us Until They Kill Us and Simon Jacobs, author of Palaces, both of whom have read right here at Volumes. Plus we’ve got their newest author, Katya Apekina coming through the store October 4th for the release of The Deeper the Water the Uglier the Fish! I’ve read so many of their titles and am continually impressed by the quality of work they are harboring into the world. As long as Two Dollar Radio is around, I know I can depend on them for a good read. 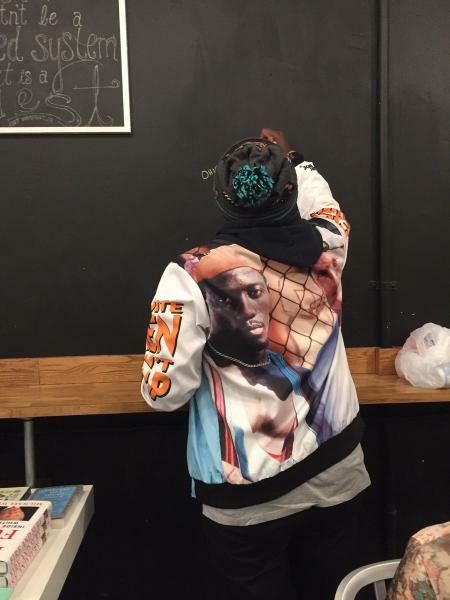 Hanif Abdurraqib signing the wall at Volumes with the inscription "Ohio Against the World." Thanks for checking out the Indie Press Corner! Next time you're in the store, let's talk about your favorite indie publishers.